Setting up Cafe Buzz for the anthology launch was relatively easy because we'd left most of the equipment the night before after the Poetry Palooza. 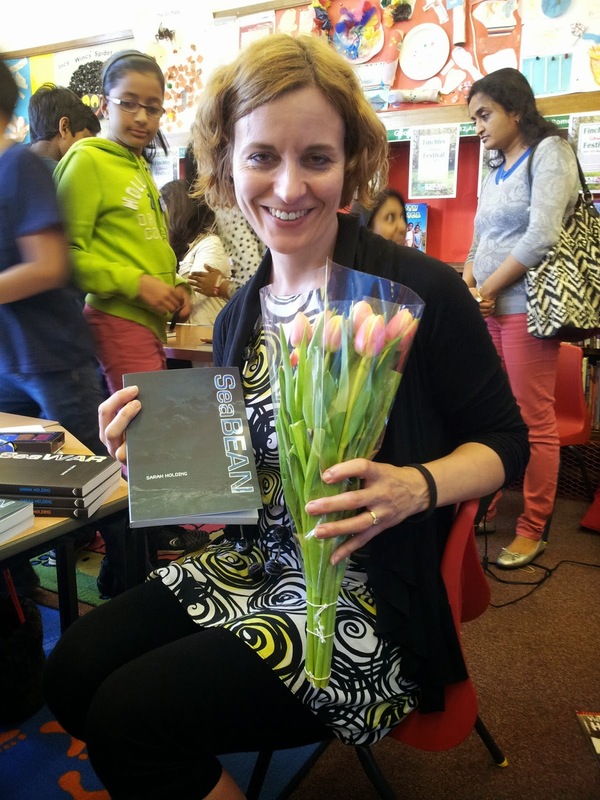 By the time I arrived, Sal Page, the Greenacre Writers Short Story Competition winner was already there. I know I'm not the only one that has that 'weird' double-take when you meet somebody in 'real life' that you have been either communicating with via Twitter or Facebook or both. You get to know each other via words and usually one photo that is flat and static. So meeting Sal was strange and familiar all at the same time. I was so pleased she had travelled all the way from Morecombe via Coventry to be with us. Firstly because Sal is a very talented writer, with a wicked sense of humour, and secondly because it is so nice to have the competition winners to present their newly published anthology in person. Unfortunately for poor Sal, she had to put up with a bit of behind the scenes usual Greenacre confusion, still at least we didn't get her to shift a grand piano! 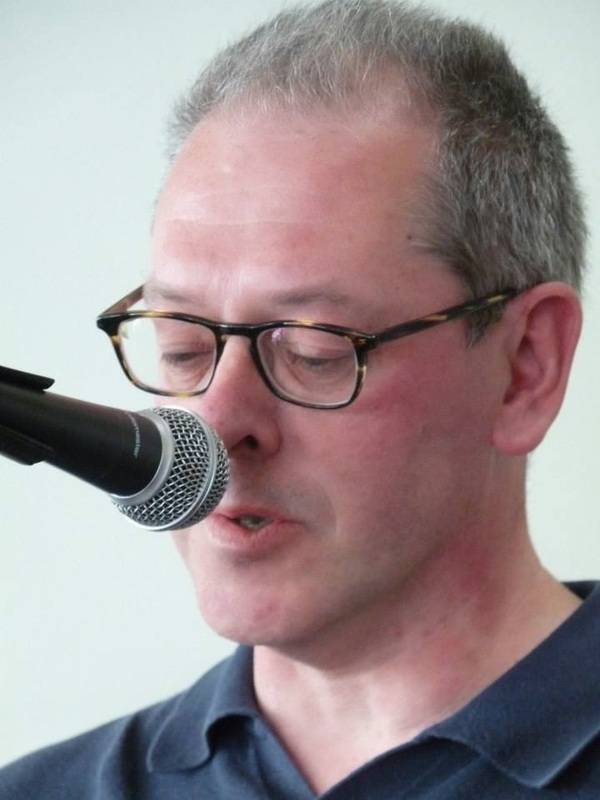 Our other guest reader was Andy Byrne, who was a Greenacre Writer Short Story 2013 Competition runner-up with his very clever story, 'Authors in Residence', literary characters come to life in this story! Our event coordinator was getting a bit impatient with readers as they stood behind the microphone either too near or too far and at one point he got up and gave us a demonstration of how to use it. I thought everybody coped really well with the 'moving' microphone and it was another Greenacre Writers success. Cafe Buzz wouldn't be the buzzy place it is without Helen Michael and her staff who served us all afternoon with delicious home-made lunches, snacks and scrummy cakes. 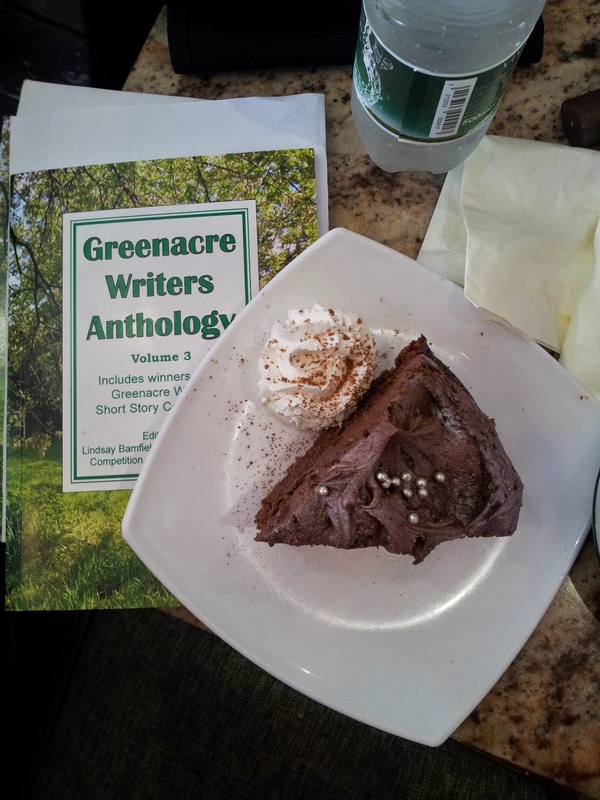 Chocolate Cake, Earl Grey Bluestar and Greenacre Writers Anthology, Volume 3 - what more could anybody wish for? Usually it is the organisers that organise surprises but we were caught unawares when presented with a beautifully arranged basket of flowers. For a moment I thought it was the end of the festival, and then Lindsay reminded me, only another 18 events to go! A wee bit embarassing as we'd told everybody to be early! As we drove past I said, 'OMG, the place is packed'. 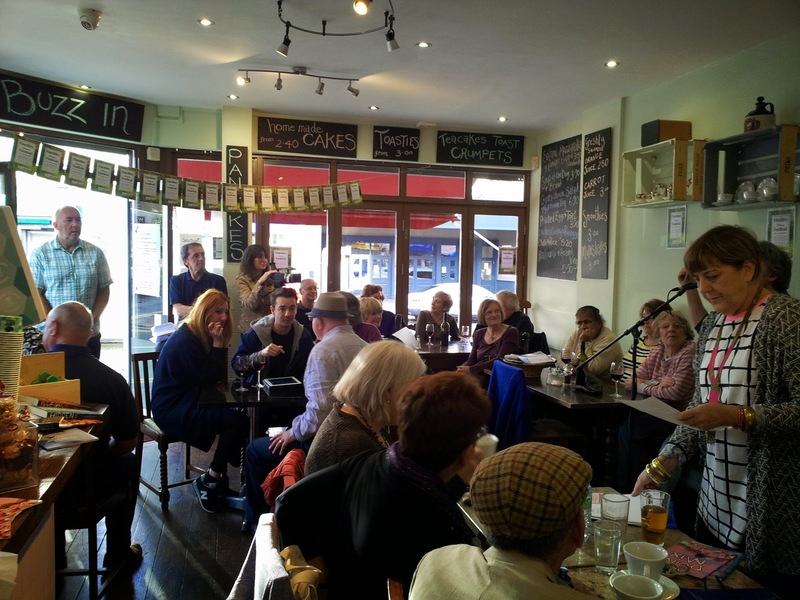 Good for Helen Michael, proprietor of Cafe Buzz, but slightly awkward for us as we had to organise space for the performers. Once inside it didn't seem to matter, Mike ordered us around, get this, do that, move this, plug that in. And once again we put up posters, bunting and moved furniture around. 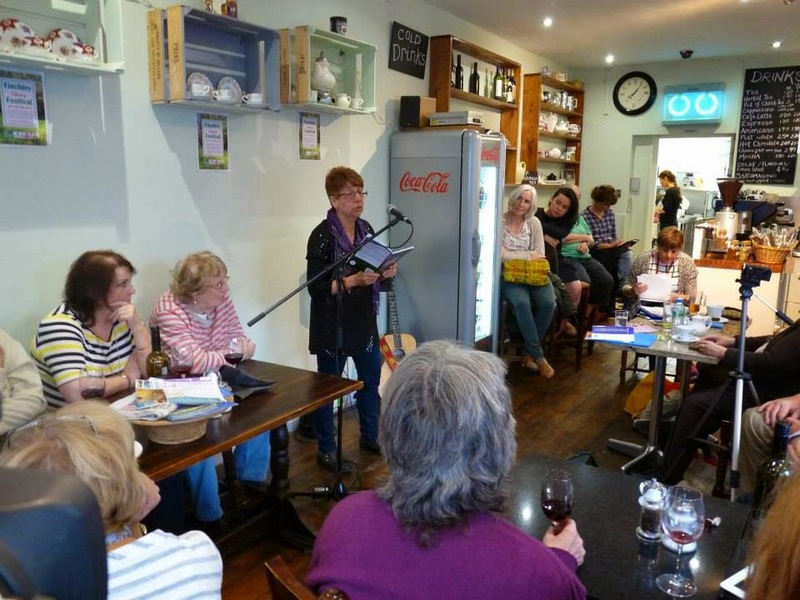 People started to arrive and Anna Meryt welcomed us all and got the Poetry & Music Palooza underway. Greg Mayston has been a Blues guitarist/singer for many years. He plays authentic 1920s, 1930s and contemporary sounds from the Mississippi Delta to the Thames Valley. Peter Sellars on violin and Chris Harper on rhythm guitar, played lively and warm-hearted jazz in the style of the 'Gypsy Jazz' sound of Paris in the 1930s and 40s. Listening to Miriam Halahmy's poem about her daughter who went travelling and hearing how her fears never subsided until she was finally back home. It doesn't seem to matter how old your children are, mothers never stop worrying! 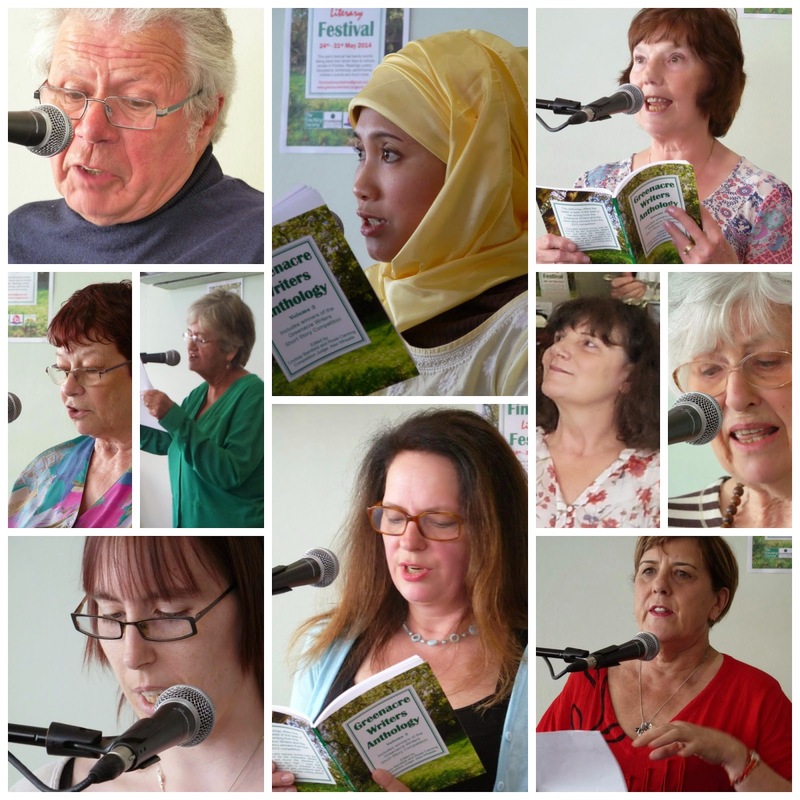 We packed the car with posters, bunting and Greenacre Writers Anthologies, hot off the press. Event Coordinator, Mike, put the key in the ignition and it wouldn't turn. We were going to be late. I was trying to stay calm, not to swear and frantically running through the list of people on the FLF Steering Committee who would be available to help. It couldn't get any worse than last year's grand piano fiasco, could it? I couldn't think of anyone. The engine coughed a few times and stuttered into life. 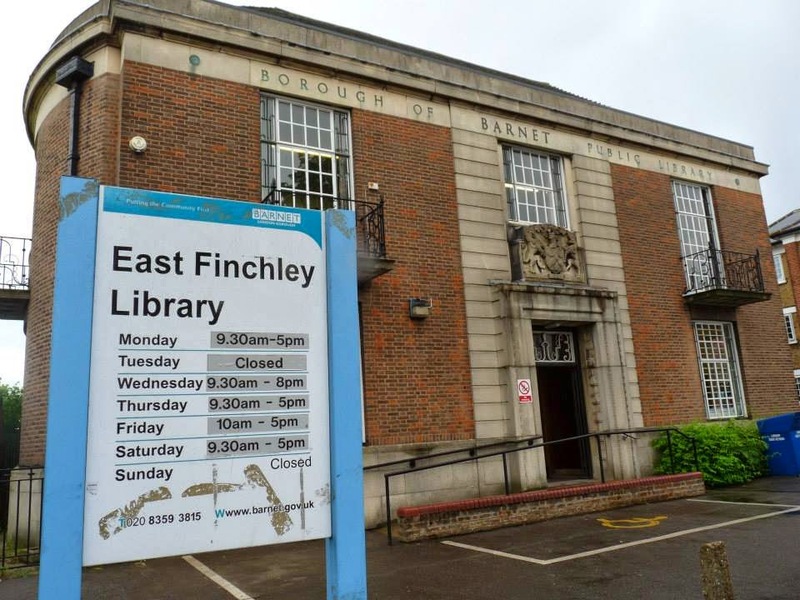 We were late but finally on our way to East Finchley Library for the first festival event. We set about rearranging the children's room in the library. Mike set up the musical equipment and we decorated the room with posters and bunting to a background of Brian Wilson which the library staff seemed to enjoy! 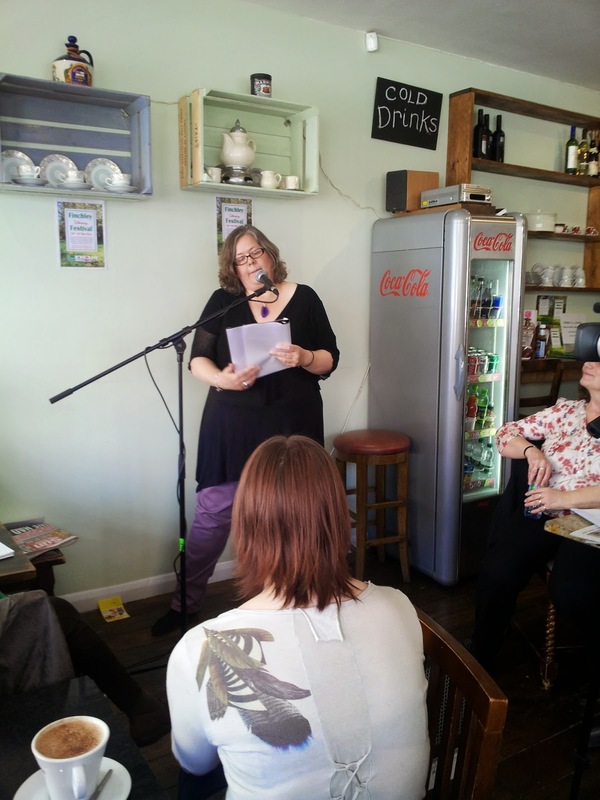 I phoned Sarah Holding, who was running the workshop, CliFi for Kids at 3pm, she was travelling from Surbiton having finished a lunchtime musical session - she plays saxophone as well as writing. She's the author of a children’s eco-adventure series The SeaBEAN Trilogy, writing in the new genre of CliFi aka climate change fiction. Here's a Guardian article that discusses this new genre. I couldn't get through to Sarah, so I guessed she was still underground. Children and parents had started to arrive and I was beginning to get a little worried. The Northern line that black line/hole in the underground often swallows people whole (pun intended). At 2.45pm, Mike said he would drive to the station and wait for her there and I was to keep phoning. At 2.50pm, I got through, Sarah and her publicist Seb Cole, had arrived. 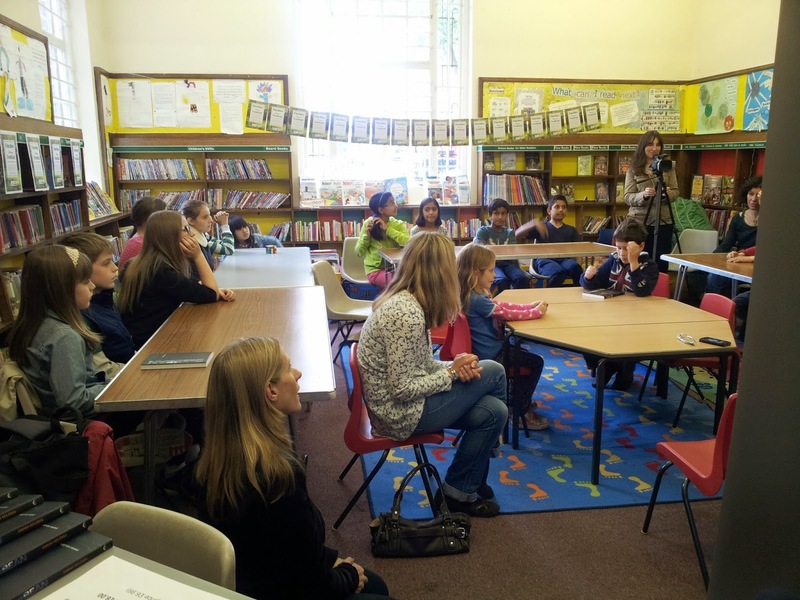 The afternoon was a rip-roaring success with children and parents transfixed by the very creative writing workshop. Afterwards, we packed up our bits as quickly as possible, the library staff were waiting to go home and we only had half an hour before the next event, the 'Poetry and Music Palooza'!